Chennai International Airport is the main hub for arrivals and departures in south India. It services just over 20 million passengers a year, about a quarter of whom are flying internationally. This makes it the fourth busiest airport in India in terms of passenger traffic after Delhi, Mumbai and Bangalore. Over 400 aircraft arrive and depart from the airport every day. The airport is owned and operated by the government-run Airports Authority of India, which means that it lacks the organization and sophistication of India's three bigger private airports. It's in the process of being modernized and redeveloped. As part of this, new domestic and international terminals were built and opened in 2013, and the secondary runway was extended. However the airport is again facing severe capacity constraints, as passenger traffic is growing by nearly 15% per year. A second phase of redevelopment is currently underway to expand the airport. It's expected to be completed by 2021 and will increase the capacity to 30 million passengers per year. The redevelopment includes the demolition of the airport's old terminals and construction of an additional new integrated terminal building in their place. This third terminal will serve as an international terminal between the two existing terminals, both of which function as domestic terminals. A multi-level car park will also be constructed. It's anticipated that the new integrated terminal will be much more user-friendly than the existing terminals, as it's being designed by a firm that was involved in the widely lauded Terminal 4 of Singapore's Changi Airport (consistently rated best in the world). Passengers can expect some inconvenience while the construction work is going on. The airport is situated about 14.5 kilometers (9 miles) southwest of the city center in Meenambakkam. Unfortunately, phase one of the airport's redeveloped turned out to be a major disappointment for passengers. The poorly-designed new domestic and international terminals, situated about 800 meters apart, lack amenities. Shoddy workmanship also resulted in safety-issues including the collapse of glass panels, granite slabs and false ceilings. The terminals were to be connected by a moving walkway when they opened but this was dropped as part of cost cutting measures. The walkway was finally completed in April 2018, and it also connects the terminals to the new Chennai Airport Metro train station. Baggage screening at the international terminal was recently upgraded but inline baggage screening is yet to be introduced at the domestic terminal. This means that departing domestic passengers must to get their baggage screened before check-in. 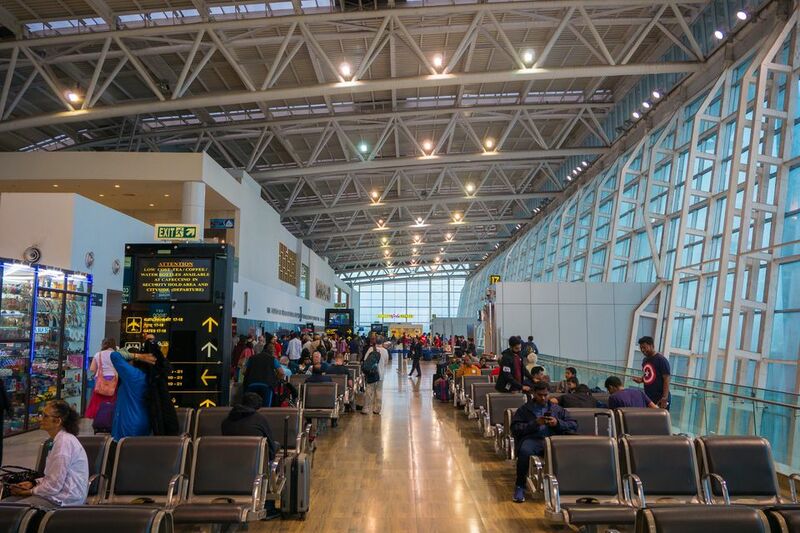 Other common complaints about the airport include poor maintenance of toilets, insufficient manned immigration counters and security checkpoints, delayed baggage collection, and the use of buses to transport passengers from the aircraft to airport terminals instead of aerobridges. A wireless Internet facility (free for 30 minutes) is available at the airport but it requires an Indian cell phone number to receive a PIN via text message. There are frequent reports of it not working as well. Despite some improvement, the variety of restaurants and shops is still underwhelming. New retail outlets with international brands are planned to open by the end of 2018. Do note that boarding calls stopped being made in the domestic terminal from May 1, 2017 to reduce noise pollution. Passengers must now rely on screens for departure information. Luggage can be stored at the "Left Luggage Facility" situated between the domestic and international terminals. The cost is 100 rupees per 24 hours. Maximum storage time is one week. Chennai airport has a lounge called the "Travel Club". It's located near Gate 7 of the new international terminal and near Gate 5 of the domestic terminal. The international lounge is open 24 hours and serves alcohol, while the alcohol-free domestic lounge is open from 4 a.m. until 9 p.m. Both lounges provide refreshments, newspapers, wireless Internet, TVs, and flight information. Priority Pass holders, Visa Infinite cardholders, eligible Mastercard cardholders, and eligible Jet Airways and Emirates Airlines passengers can access the lounge free of cost. Otherwise, you can purchase a day pass for entry. App-based cab services Ola and Uber operate at the airport. Both have booking kiosks and dedicated pickup areas there. At the domestic terminal, the Uber Pickup Zone is located at pillars 6-8 opposite Arrival Gate 3. At the international terminal, the Uber Pickup Zone is beside the Uber kiosk. Expect to pay around 230-300 rupees to Egmore. Fastrack Cabs is another popular private taxi service at Chennai airport. Fares have been reduced to compete with Ola and Uber. It's also possible to take a prepaid taxi from the airport. It will cost about 350 rupees to Egmore. The new Chennai Metro train connects Chennai airport with Chennai Central on the Blue Line. Trains run from around 6 a.m. to 11 p.m, with departures every 20 minutes during non-peak hours and every 10 minutes during peak hours (see timetable). The one-way fare is 70 rupees (see fare chart). Self check-in counters are provided at the Airport Metro station for outgoing airline passengers. Alternatively, a Metropolitan Transport Corporation bus service goes from the airport to the city center. Take bus 18A from the bus stop outside the terminal building. However, do be prepared to walk quite a distance to get there. When dropping off or collecting passengers, cars must enter and exit the airport within 10 minutes. Otherwise a parking fee is levied, irrespective of whether parking facilities have been used. This can be challenging when the airport is congested, as the toll booth is located through a service road at the end of the airport. The fee is 150 rupees for two hours. The retiring rooms at Chennai airport are currently closed due to construction works. Instead, a number of nearby hotels cater to transit passengers, with options for all budgets. This Chennai Airport Hotel Guide will help you decide where to stay.